Fort Carson, also know as "The Mountain Post", was first established in 1942 and has continued to be one of the top bases in the country for military training and skills development. The base itself sits at the foot of Cheyenne Mountain and is just a short 15-minute drive away from downtown Colorado Springs. Military families living in homes near Fort Carson can enjoy all the convenient amenities of the big city while still being only just a few minutes from the base. With breathtaking views, unsurpassed convenience, and a great selection of new build communities and new homes available, you're sure to find your dream home that has everything you desire with the location that you need. Learn More About Fort Carson Here. Southwest Colorado Springs includes several communities located adjacent to the five-star Broadmoor Resort. Neighborhoods surrounding the Broadmoor offer many options in custom homes. Established neighborhoods with lush vegetation such as Lower Skyway and Cheyenne Canyon are filled with older ranch-style and bungalow-style homes. Cheyenne Canyon has more-affordable housing. Set at the base of Cheyenne Mountain, there are trails to hike and bike, waterfalls and spectacular views. Attractions include Cheyenne Mountain Zoo, Pikes Peak, Garden of the Gods and Seven Falls. The Southwest neighborhoods offer convenience to Downtown, Fort Carson, and Cheyenne Mountain AFB. Most of the southwest is served by Cheyenne Mountain School District 12 which is one of the leading districts in the State. 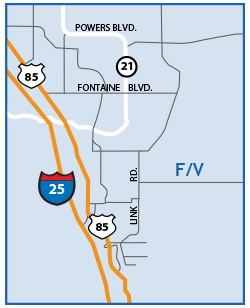 Fountain Valley neighborhoods lie immediately southeast of Colorado Springs and east of Ft. Carson. This area is bordered in the west by Ft. Carson, in the northwest by the southeast neighborhoods in the east by Drennan/Truckton, and in the south by Pueblo County. The large Army post of Ft. Carson is the most significant landmark in this area and I-25, the major artery to Denver in the North and Albuquerque to the south, runs north-south through this region. The principal communities of this area are Security, Widefield, and Fountain and they abound with newer and older homes. Featured neighborhoods include Countryside, Fountain, Lorson Ranch, Security and Widefield. The neighborhoods in this area are served by school districts 3 and 8.